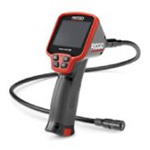 Our New Ridgid Sewer Cameras have some very special capabilities. Our large machine has the ability to see down a 2 1/2″ – 6″ sewer pipe to locate the sewer or sewer problems. The cameras can also be used to locate other things such as: a plug in a Central Vacuum System, or down a well casing, or a heating vent, or anything that has piping. Our small cameras can go through piping as small as 3/4″ water lines. A few years ago, the same sewer camera system was used to locate people in a collapsed mine, it was sent down one of the vents. It’s a very versatile machine that can see behind walls and in very small, tight places we otherwise cannot reach or see. You Lost It Down “There”? We Can Find It! We have found cell phones and even a diamond engagement ring down a sewer line. If you have something you need to find in a very difficult place, give us a call, and we will find it and be able to retrieve it with the least amount of damage to your property.